Choose from an array of Panetar sarees online at Kalki. View our printed tussar silk sarees, Georgette sarees and White sarees in zari and sequin work. India is home to people belonging to a different caste and creed. Each social group has their own set of rituals for which there would be a special outfit required. Like Gujaratis have a typical wedding attire for brides comprising of a gharchola and panetar saree. Panetar saree is ideally supposed to be a gift from the bride’s maternal uncle while gharchola is gifted by the bride’s new in-laws. How does a Panetar saree look? Panetar saree is characterized by pure white color. It was historically made from Gajji silk but with evolving trends it is now made from all types of fabrics like crepe, georgette, organza and chiffon as well. Now almost all Panetar sarees also have a distinctive red colour border on it. The border has a meticulous artwork in the form of zari, kundan, cutwork or sequin work. 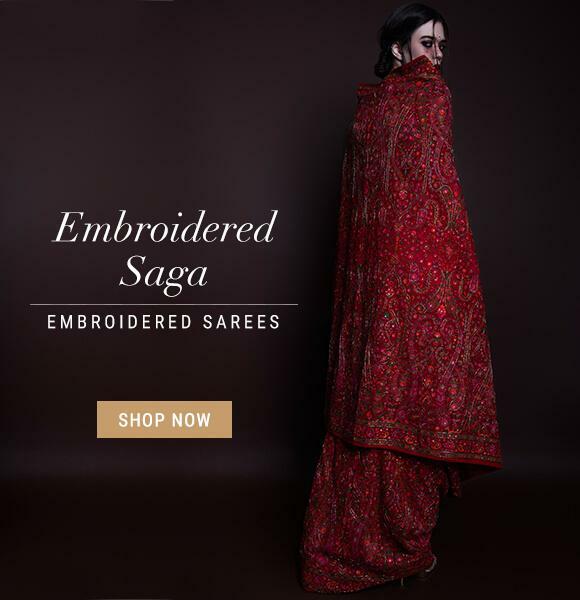 How is a panetar saree worn? Panetar saree is worn like any other saree or sari. The only difference in this Indian saree style and others is that it is generally worn under the gharchola signifying the bride’s beginning of a new journey as she gets married. A panetar saree’s paloo is taken from back to front from the right shoulder. The new way of carrying this Indian saree style is like a lehenga. 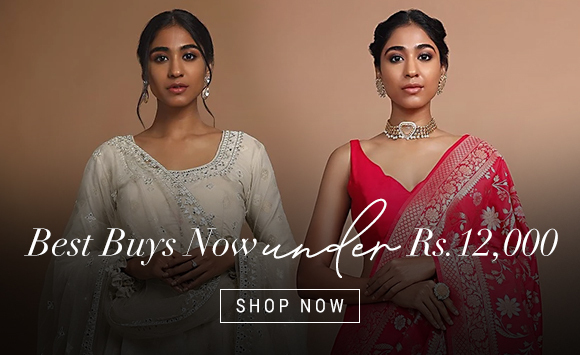 If you are someone who wants to be a chic yet traditional bride, exclusively designer panetar saree is an excellent bridal wear choice for you. How to style a panetar saree? If you are going the retro way, why not go long? When you buy exclusively designer panetar sarees you can also pair them with traditional neckpieces, maang tikkas, kamarpatta and bazubandh. When it comes to being a bride, every woman wants to look the best she has ever looked. To add that tinge of uniqueness to your wedding outfit, you can go for colours like green or peach. Another way to look out of the box with an emblematic outfit is by changing the draping style. For brides who are not bound to drape panetar sarees in a certain way, new draping styles with the same saree can help a big deal. Unsure about how a mainstream traditional saree will look on you? Check out the exclusively designer panetar sarees from Kalki. We also have an on-board virtual assistance and something for every bride who chooses to buy sarees online for her big day!